K-Docs™ is a robust, web-based litigation management system and highly sophisticated database that delivers high-volume information, retrieval and distribution to anyone who needs it anywhere with secure Internet access. K-Docs was designed with the mass tort litigation in mind, allowing attorneys, paralegals, and experts to easily have access to the data required to accomplish tasks. Security controls can be accessed by individual or groups and can be controlled to the field level. Our process starts in K-Docs with the records retrieval ordering process—it will handle individual orders, update orders or mass infusion of orders by means of load files created in ASCII format, excel, or XML. The entire workflow process, from records and nurse review, happens in the same portal. This will insure the one time touch entry of data to increase productivity and accuracy. The capabilities of K-Docs allow the records order process to be accurate and efficient. Nurse productivities increase by utilizing a multitude of features that allows the nurses to mine the information quickly. Searching for text within all documents stored in K-Docs is easy with Optimal Character Recognition (OCR), native to K-Docs. The searched word is highlighted on the image when found. In addition, all documents containing the searched word are "pulled" into a separate batch of documents. K-Docs also handles complex Bates numbering, redactions, conversion of scanned text into real text to insert in a nurse work product. 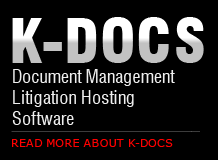 Your litigation team has full access to all the features and benefits of K-Docs. Records can be downloaded in batches, reporting of order status can be customized, and automatic notification of new records can be created. The nurse work product is hyper-linked to the source document, allowing easy retrieval of documents for depos, experts, etc. The source documents referenced in the nurse work product can be compiled with a single click and compiled into a new document set. 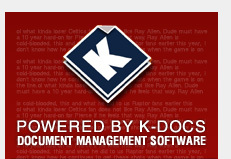 K-Docs eliminates lost documents, reduces document retrieval time and costly handling of the paper process. As a central repository solution for vital organizational information and knowledge, an individual's knowledge translates to corporate intelligence that can be used by the entire organization with consistency. K-Docs is a flexible application capable of handling multi-departmental needs. Our experts will work with you to develop the data fields relevant to your litigation team. You can have multiple "looks" for different workflows, projects, departments, campuses, offices, etc. K-Docs will make it easier for your team to work by centralizing vital information and documents from wherever they are. Documents can be shared at the same time, and multi-layered access allows employees to see and change only the documents they’re authorized to handle. Fragmentation associated with remote employees and satellite offices is eliminated. Your most important information will be secure from internal and external threats, including competitors, disgruntled employees, and natural disasters. This is accomplished through multiple levels of password-protected access for groups and individuals; encryption of document contents; and audit trails to show who has accessed or updated document. Aggregate functions to determine averages, sums, deviations, etc.